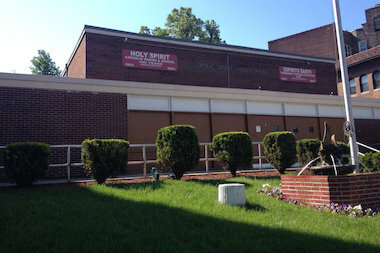 Juan Martinez, 58, was stabbed in the gym of the Holy Spirit Catholic Church, police said. MORRIS HEIGHTS — A man was stabbed to death by one of his in-laws during an argument over leftovers and a chafing dish after a vow-renewal ceremony in a Bronx Catholic church, police said. The bloodshed left Juan Martinez, 58, the wife's cousin, dead and his attacker, the husband's nephew, Mike Garcia, 37, in handcuffs, sources said. The two families had gathered inside the Holy Spirit Catholic Church, at 1960 University Ave., for the ceremony and went to the adjoining school's gym for a reception when the fight broke out about 9 p.m. Sunday, sources said. "I saw people crying. They were all wearing white," said longtime neighbor, Raymond Diaz, 31. Martinez was rushed to St. Barnabas Hospital and pronounced dead, police said. Garcia, of Wakefield, was apprehended at the scene and charged with manslaughter and criminal possession of a weapon, the NYPD said. Investigators believed that Martinez and Garcia began arguing over who would take remainder of the food after the ceremony, a police spokesman said. The fight escalated when one side accused the other of stealing the church's chaffing dish, a source said. The church ceremony erupted into a melee. "Fists started to fly, then chairs and then the knife came out," the source said. Garcia stabbed Martinez in the leg, cutting his femoral artery, causing him bleed to death, sources said.